What you might NOT want to name your German Shepherd puppy! Naming our new GSD puppy was something we took very seriously. After reading all the advice and deciding between the final favorites, it came down to two names, "Rex" and "Marco." My husband pushed for the name "Rex', after the DC Comic book hero "Rex the Wonder Dog", known for his strength, speed, stamina, intelligence and ability to communicate with humans, (and the name of his own childhood dog). I did like that name but I also liked the name "Marco", from a character in a series of books I'd read with my son when he was growing up. The character morphed into a German Shepherd and was his favorite, and I have many fond memories of the hours we spent reading those books together. When our pup first came home and I was trying the name Marco out, it fit great. But I soon realized that it came with a second name I hadn't planned on. Every time I called "Marcooo", at least one person would respond with, "Polooo". It was quite funny for a few days but soon grew old. Even out in the neighborhood, if I called to him in the yard, I'd hear someone nearby responding "Polooo". The poor pup didn't know if his name was Marco, Polo, or Marco-Polo! Luckily he was young enough to adjust quickly to his new name, Rex. LoL! Hello to you, Jody. We are so glad you decided to come and share your GSD story with us. 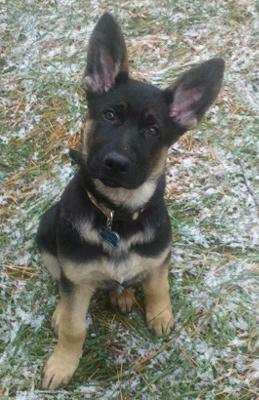 What a great story and what great advice - I have to remember that the next time I get a German Shepherd puppy or Dog. I’m still giggling as I picture the outcome of this in my mind. And so many people just don’t take the time to investigate the full repercussions of making a simple choice like this - but it is a lifelong one too.